Containing ten different cream based concealers, this palette allows you to combine shades to create the perfect one for your skin tone. The concealers offer full opaque coverage and are easy to apply and blend with a concealer brush. 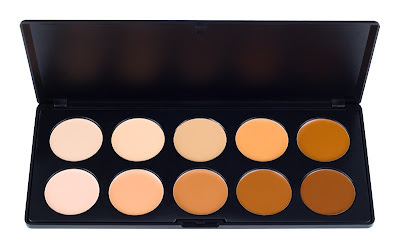 This is a great palette for everyday use or by makeup artists. The matte black case contains the Coastal Scents logo as well as the name of the palette, and is ideal for travel. Squalane, Octyl Palmitate, Beeswax, Talc, Polymethyl Methacrylate, Petrolatum, Propylparaben. May Contain : Titanium Dioxide, Iron Oxides.